Alibaba stock is down another 2.9% this week after a report from Barron's indicated the e-commerce stock could fall another 50%. Alibaba Group Holding Ltd. (NYSE: BABA) shares hit a high of $120 in the two months following the company's September 2014 IPO. But Barron's issued an Alibaba stock price prediction that sees BABA slipping from its current price near $63 all the way down to nearly $30 per share. Barron's cites Chinese economic struggles, increased e-commerce competition, and the company's unique corporate governance as reasons the stock will continue to fall. "It's time to get real," the article said. "A decline of up to 50% looks far more likely. Alibaba shares trade at about 25 times the consensus earnings estimate for the year ahead, and that should be closer to eBay's multiple of 15." But according to Money Morning experts, the Barron's article got it wrong. "I have great respect for Barron's," Money Morning Executive Editor Bill Patalon said. "It's a great publication and has a contrarian bend just like me. But nobody's perfect and, in this case, the writer got it wrong." According to Patalon, the Barron's report doesn't address the right time frame. Pullbacks like this are very common for new issue stocks. "I knew that, as a hot IPO, there was every chance the stock could – and probably would – sell off," Patalon said. "It's a 'transformational' type of company, meaning its leaders are 'planting seeds' right now that will have big future payoffs." You can't look at Alibaba stock with a short-term perspective. This is a company that is building for the long-haul. Jack Ma isn't overly concerned with quarter-by-quarter data. "Alibaba's moves into entertainment, media, cloud computing – these are all part of a broad vision Jack Ma and his executive team has for Alibaba," Patalon said. Patalon says the article is also wrong when it compares Alibaba to eBay Inc. (Nasdaq: EBAY). BABA got ahead of itself and your Alibaba enthusiasts such as Michael Robinson and Bill Patalon simply were blinded to the price ( P/E of 50 ) last year. Even a blind man could smell risk, especially right after a huge IPO and all the buzz, which apparently is continuing. Now, insider selling is putting pressure on the price and leading it down. The subject Barron's article made a number of valid criticisms, the other side of the same coin, that was overlooked by China boosters. The China Story is still valid and so are companies connected with it, but you have to take the long view to get there. 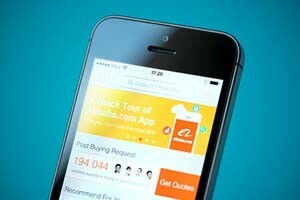 Alibaba at $90/share was speculative, while if priced at $50.00/share is a value (Still a Possibility). Big difference.